When my wonderful husband and I married 40 yrs ago we received 9 pr of beautifully embroidered pillowcases for our wedding. I also am blessed to have 2 pr that were found in his mother's hope chest after she passed, we think they were made by my husband's grandmother. I also have a pair made by my beloved grandma as well as a pr I made in high school in Decorative Arts Class. 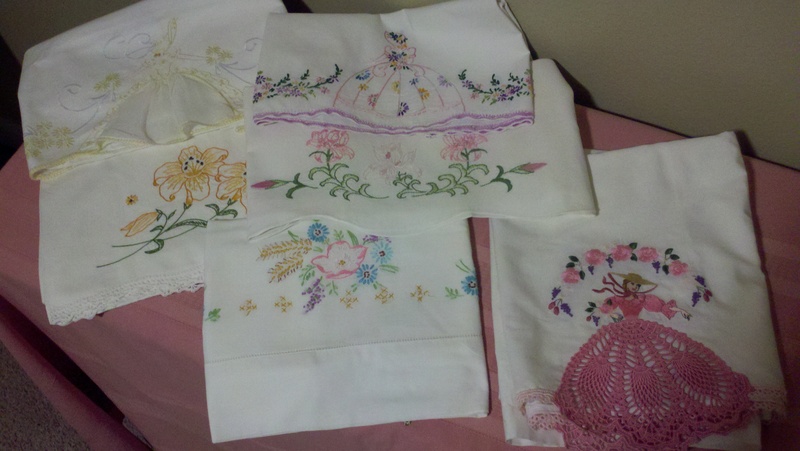 These hold a lot of treasured memories for me as they remind me of the lovely ladies who embroidered them. I used them when we were first married but all of them are for standard size pillows... of which I have none. I have had these hidden away in my linen closets for at least 35 yrs I think. I would like to have them out where I can have the pleasure of seeing them and actually enjoy them. So..... I decided I want to make a quilt featuring these treasured pieces of time gone by. My questions revolve around the beautiful edgings of tatting/hemstitching and crocheting that I don't want to lose, that's part of their beauty. I know that if I use Fray Block on the crocheted/tatted edges and then zig zag it after it dries, I can safely snip that area with no chance of it fraying. My questions are: how would I treat those decorative edges then when I want to add a sashing around each pillowcase?? I would like to have each pillowcase as a 'block' if that makes sense. Obviously, I don't want to create a seam there along the bottom edge. Could I somehow topstitch the sashing on the lower edges @ the 1/4" mark,....or??? I also thought of using a foundation piece as in Crazy Patch and attach them all to the foundation piece but then I would lose the individuality of each piece. As you can see I am stumped! I have googled my idea using my pillowcases for a quilt and came up empty handed. I know this will be quite an undertaking as I want to be very careful how I proceed with not only cutting them but having a well laid out plan for making them into a quilt. Any ideas would be so greatly appreciated. I attached a photo to show the different decorative edges I am trying to preserve. Last edited by Divokittysmom; 02-23-2012 at 09:49 PM. First I want to tell you those are lovely treasures! How beautiful and precious. I dont have a solution, except to say that you might look into what folks to with vintage hankerchiefs in making quilts, and you might get some ideas and instructions that way. Please keep us posted on what you end up doing. Just gorgeous. Forgive me as I am new to quilting, but what about somehow attaching a small strip of the original pillowcase fabric underneath the lacey edges so that the "block" still shows the embroidery and the lacy part with a bit of white below the lace? I dunno if that would work at all but it was just a thought. I'm thinking your blocks might not all have the embroidered piece in the center necessarily, but you would still be showing your lace edges like you want. Just an idea. Good luck with the project... the pillowcases are simply beautiful and I applaud you for wanting to create a new heirloom to showcase them. I have actually made 2 vintage handkerchief quilt, that's where I got the idea of the foundation piece to stitch the pillowcases to. That idea still may be the most viable option I have for preserving the decorative edges. Thank you for our response! I forgot to add that I want to embroider the name of the person who embroidered them for us under each pillowcase. Last edited by Divokittysmom; 02-23-2012 at 10:04 PM. When my mother passed we found a lot of pillow cases and other things that she had that were my grandmothers and my mothers. They had been around for so many years that they dry-rotted. When we hand-washed them they just came apart. I was just crushed. I don't know why they came apart but I hope it doesn't happen to your treasures. I think you have some good ideas. Good luck! Last edited by eashka; 02-23-2012 at 10:12 PM. Oh, not sure how to go about that but those are beautiful!!!!! I have no suggestions, I just wanted to say your treasures are absolutely beautiful. You are so lucky to have these and they are still in such good shape. My suggestion would be to applique each onto a square of muslin and then just sew the trim to the muslin at the point where it is attached to the pillowcase leaving the trim as an embelishment and room to embroider the names below. Just a suggestion. These are so beautiful. How lucky you are to have them. I used FrayCheck on a tiny tear in a shirt- and it dried really scratchy- like nail polish. Your pillowcases are beautiful! Those are beautiful. I dont have any ideas . But whatever you decide to do, it will be a treasure. I have dozens of hand done pillowcases from my Grandma. I think your quilt idea is wonderful!! Please keep us posted if you make a quilt. I'd love to see where this idea takes you. I would use the whole front of the pillowcase for the block. I would take the whole front of the pillowcase apart from the back and then fold so the part under the crochet work is a couple of inches longer. That way the crochet work is loose from the back but you don't have any raw edges to deal with except around the outside edge. I am adopting some theories as I continue to read suggestions. Thank you sew much for the lovely compliments and great suggestions. I know it will be larger than the Handkerchief quilts but I think still do-able by hand. Thank you sew much for helping me brainstorm this out! I appreciate all your responses! Thank you!! Monroe: I agree with you about Fray Check...it does dry harsh and stiff. I switched years ago to Fray Block by June Tailor, it dries much softer, I use it in heirloom work all the time. Why not applique these pillowcase sections to a white whole cloth quilt? You can arrange the pieces the way you love them without having to worry about blocks, sashings etc. You would just have the beautiful heirlooms and then surrounding them marvelous quilting repeating the designs of the pillowcases. Last edited by TanyaL; 02-25-2012 at 02:32 PM.